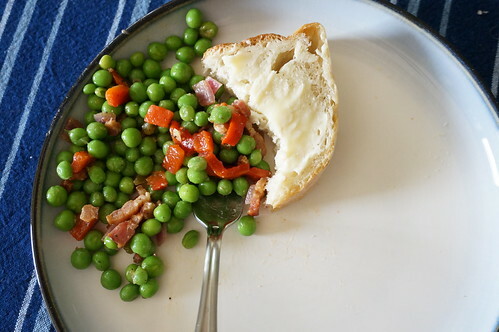 Ah, spring, when a young man’s fancy lightly turns to… peas. What, you thought I’d say asparagus? Don’t get me wrong, asparagus is lovely, but for me the pea is the king of spring vegetables. They’re one of the first vegetable-vegetables we see (as in, not a giant grassy thing — sorry, sparrow-grass), and their delicateness seems like a real marvel after a long winter of root vegetables. And they’re so sweetly delicious! I’ve even seen them called Nature’s Candy (though that goes for probably fifty percent of sweet produce out there, so take that with a grain of salt). Some of you folks down South have already zoomed way past pea season by this time of year, but for those of us up in the Great Lakes region, this recipe is really more like wishful thinking: the crocuses and daffodils have barely begun pushing their way out of the ground, so we still have a good long way to go till we have peas and asparagus. And that’s a shame, because once the weather turns I become ravenous for light, sweet green things: baby greens, asparagus, PEAS. Thank goodness for the frozen vegetable aisle, which helps to fend off my cravings. Without frozen peas, every April you’d find me wandering the farmer’s market like a hapless vegetarian zombie. So: about those peas. 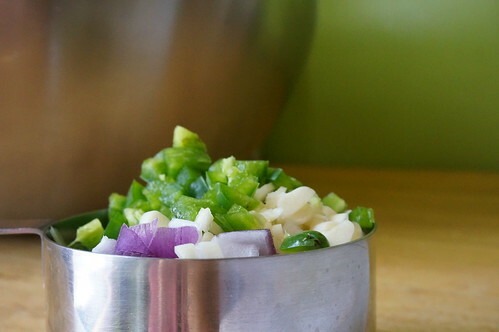 Once I started feeling my pea craving, I knew I wanted to make a pea salad for two reasons. First, pea salads have been on my mind since November, when the New York Times posted “The United States of Thanksgiving,” a recipe collection that supposedly evoked every state, and infamously included an English Pea and Onion Salad for Ohio, which has made sense to exactly zero of the many, many Ohioans I discussed it with. 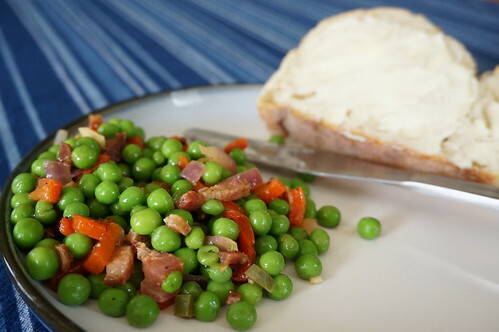 Second, while doing some research on the elusive, mythical Ohio pea salad, I ended up rereading the Homesick Texan’s piece on English Pea Salad, a Texas classic, and got a bit homesick. So here it is, finally spring, and I’m making pea salad. Not a classic Texas one, though the jalapeños certainly nod to that heritage. And not Jonathon Sawyer’s much maligned peas and onions, which honestly didn’t sound half bad for all their inexplicability. No, this one’s all me: fresh bright peas, some roasted red peppers for color (and year-round availability), jalapeños for a little oomph, and a warm bacon dressing to fight off the early spring damp. Happy April, y’all. With its fresh sweet peas, mild spicy zing, and room temperature appeal, I think of this salad as a perfect potluck dish, so I make it in large quantities. It’s easily halved if you don’t have a dozen mouths to feed! Bring water to boil in a large saucepan, enough to cover the peas. 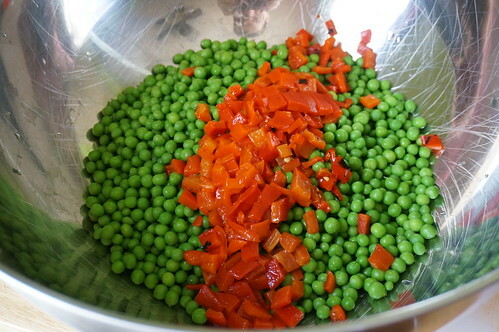 Once the water is at a full boil, pour in the peas and cook 2-5 minutes, till they are bright green, sweet, and tender. (Fresh peas will likely take closer to 2 minutes, frozen vary depending on brand — best to fish a pea out occasionally and taste it.) Drain the peas in a colander and rinse with cool water to stop cooking. 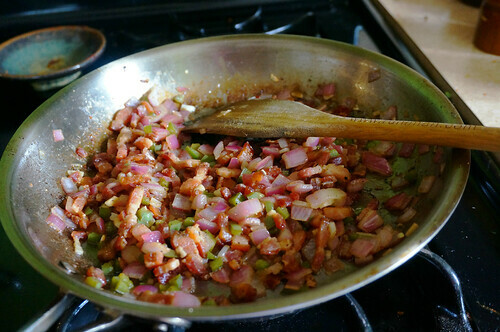 In a medium skillet, combine the bacon and a few tablespoons over water (the water will help to jumpstart the rendering process). Cook over medium heat, stirring occasionally, till very crispy. Do not drain fat; add onion, garlic, and jalapeño to skillet and saute for 60 seconds over high heat. Add the vinegar and stir, scraping up all the browned bits. Allow the vinegar to boil down so the dressing thickens a bit (this may already be done by the time you’ve scraped up all the bits). 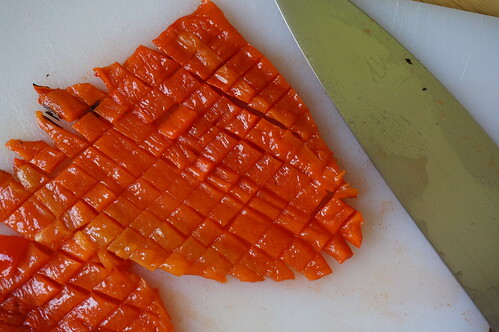 Remove from heat and stir in the sugar, along with salt and pepper to taste. 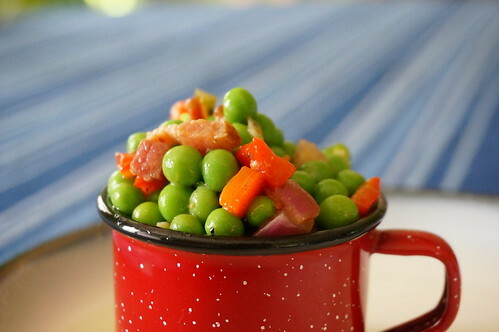 In a large bowl, combine the peas, red pepper, and bacon dressing, scraping every last bit from the skillet. Toss to combine, and adjust seasoning if necessary. Serve warm or room temperature; depending on how long the peas have waited in the colander, the salad may require a bit of reheating in a large skillet or the microwave. I rather like the bite of the lightly cooked red onion, but I can attest (from cooking for a friend with an allergy) that it’s very tasty without, so if you’re an onionphobe I give you permission to omit! You might consider doubling the garlic in that case. I occasionally have trouble finding white wine vinegar in the store. If you’re having that problem, this would be perfectly lovely with apple cider vinegar or red wine vinegar; you might need to skimp a bit on the sugar for the apple, and bump it up a bit for the red, but use your own judgment. Jalapeños: to my palate this is a very mild level of spice, though you might get the odd fireball jalapeño. If you’re worried about the heat, I’d probably suggest omitting rather than reducing the amount; the flavor won’t carry very strongly if there’s much less. Conversely, if you like more heat, I wouldn’t bother seeding the jalapeño; just make sure your guests know what they’re biting into! Bacon: I didn’t mark this as veg*n-possible, because I think the bacon’s pretty integral here. That said, you could probably veganize this successfully: I’d double the onion and cook half of them for a nice long time in a 3-4 Tbsp of oil until they’re very brown, and then add the rest of the onion alongside the garlic and jalapeño, as written. You’ll need more salt to make up for the saltiness of the bacon. If you try it, let me know how it goes! Well I have to admit that I do enjoy the mayonnaise-based salads, too, but maybe not with the canned peas! I think you’ll enjoy this version, though — lemme know how it goes.